Friends! Catch me on QVC tonight, January 21st from 8-10pm EST promoting my first cookbook. Thanks for tuning in! First and foremost, thank you SO much for your overwhelming support and love on my big announcement yesterday. I am so grateful to have such a loving online family. You guys just make my day, everyday! And to thank you, I’m bringing you even more chocolate desserts for two for Valentine’s Day. Deal? I hope you love chocolate! By reader request, I started working on a chocolate pound cake recipe with raspberry sauce a few weeks ago. There are a few other poundcake recipes on this site; see: marble swirl pound cake, cream cheese pound cake with strawberries, ricotta pound cake cupcakes with whipped ricotta frosting, grapefruit pound cake, and classic pound cake with stewed plums. But as predicted, since I’m a diehard lemon dessert lover, I was lacking in the chocolate poundcake department. Many thanks to reader Emily who requested this recipe! I’m so glad to be bulking up the chocolate recipes on this site right now. Keep those chocolate dessert requests coming, and I’ll get right to work. 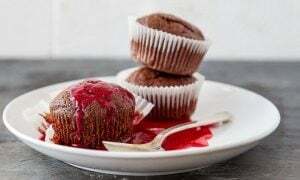 Since it’s Valentine’s Day soon, and a pretty dessert is just as important as a delicious dessert, I thought we’d make mini pound cakes in a muffin pan, and plate them with a bright red raspberry sauce swirled on the plate. If you want to get even fancier, add vanilla ice cream on top, and swirl the melting ice cream into the sauce. I meant to eat mine with ice cream, but they were just too tempting warm right out of the oven, so I gobbled them up right away. This raspberry sauce is brightening so many desserts in my house these days. It’s made with just raspberries, honey, and lemon juice, and the fresh flavor is the perfect balance to almost every chocolate dessert–even those with caramel (recipe coming soon!). I’ve even splashed leftover raspberry sauce on my oatmeal the next day. One quick note about this recipe: you can make these mini pound cakes ahead of time to streamline your Valentine’s Day dinner plans, but be sure to reheat them a touch in the microwave before serving. Since the batter is made with melted chocolate, they can firm up once cooled. A quick 8-second zap in the microwave will make them soft like they just came out of the oven again. 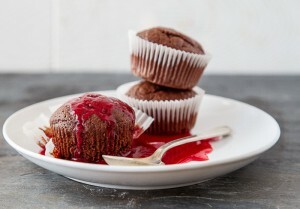 First, preheat the oven to 350-degrees F, and line 4 cups in a muffin pan with cupcake liners. Next, in a small microwave-safe bowl, melt the chocolate chips. To do this, pulse it in the microwave on LOW for 20 seconds. Stir between each pulse. Remove from the microwave before everything is completely melted, and stir to combine until it is smooth and silky. In a separate medium bowl, beat the butter and sugar together until light and fluffy, 1 minute. Next, beat in the egg and vanilla extract. Stream the melted chocolate into the butter-sugar mixture and beat until combined. Next, combine the flour, cocoa powder, baking powder, and pinch of salt in a small bowl. Whisk it together with a fork. Add half of the dry ingredients to the wet ingredients, stirring just to combine. Add the tablespoon of warm water and stir to combine. Finally, add the last of the dry ingredients, and stir until no lumps remain, but do not overmix. Divide the batter between the 4 cupcake liners, and bake for 18-20 minutes. When done, the top will spring back when touched and appear dry. 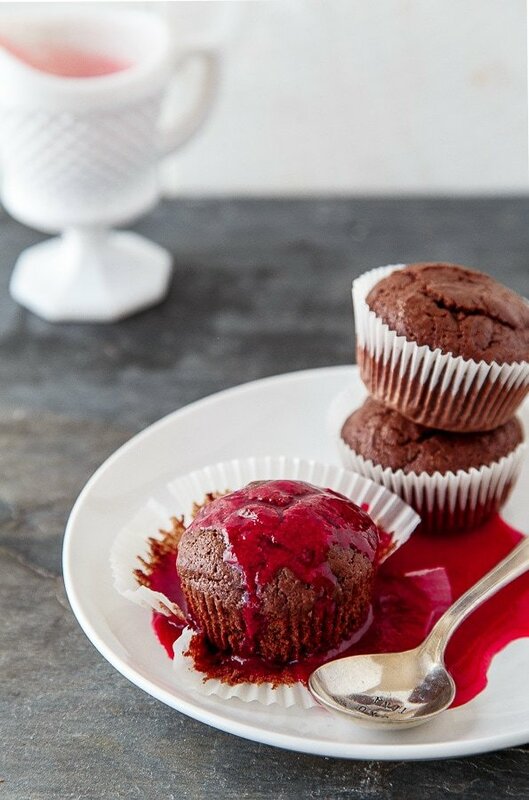 Serve immediately with raspberry sauce (recipe below). 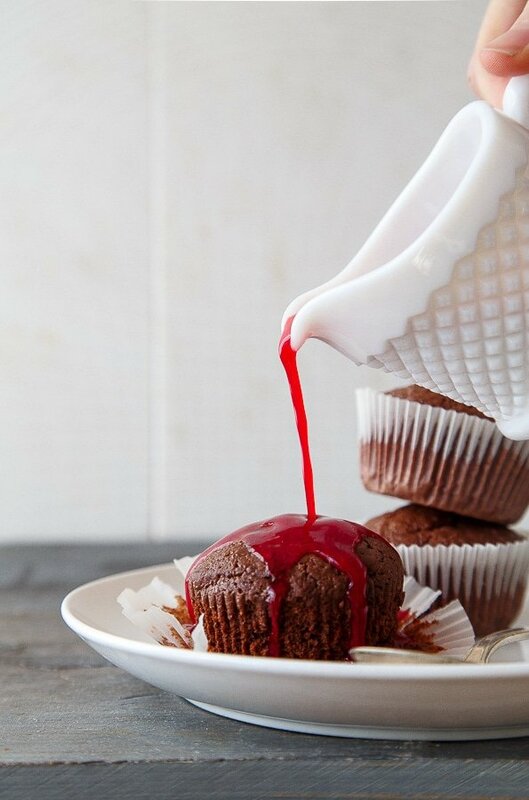 To make the raspberry sauce: combine all ingredients in a small saucepan. Bring to a boil and cook until the raspberries dissolve, about 3 minutes. Strain the mixture, and serve with the chocolate poundcakes. *You can make the chocolate poundcakes ahead of time, but be sure to re-warm them in the microwave for 8 seconds to soften them slightly. Dang, this is one heck of a gorgeous recipe! I love that sauce! Bring on the chocolate recipes! These are gorgeous, Christina! And can’t wait to see your QVC debut…yay!! I’ve been reading your blog for several years, ever since I found your great recipe for chocolate chip cookies, but never made a comment. I am so happy for you, congratulations on your first book and your first baby! You’ve helped me and my husband rediscover dessert in small portions, and such beautiful little desserts. I wish you much success and happiness, you deserve it. Knock’em dead tonight on QVC! Beautiful cakes!! And I love the idea of that raspberry sauce on oatmeal… And yogurt… Anything I can do to bring it to the breakfast table! Congratulations! I just watched the replay of your QVC appearance, & to sell out in less than 5 minutes is huge. Best wishes to you and your family!! Watched you on QVC last night–great debut! You looked beautiful but that dessert table was incredible! I wanted to eat my way from one end to the other. Can’t wait to get your cookbook. I was sorry to miss you last night on QVC–I had a meeting, but will play it back today–hopefully. Your Huge News was a delight. I am enjoying your recipes–the chocolate chip cookies are a go-to recipe. I take meals to elderly friends every two weeks and your cookies are a perfect treat for them. I will make the pound cakes the next time I take dinner over. That is so great to hear, Beth! I love that you use my small-batch recipes to take as gifts to elderly friends :) That warms my heart so much! Hi Christina! I just wanted to say congratulations on your cookbook sellout on QVC! I purchased one and cannot wait to receive it. You are so adorable, humble, and sweet and I was so excited for you when David Venable announced your cookbook was sold out! Your recipes look amazing and your photography skills are professional quality. I’m so very happy for you and wish you all the success and joy that’s coming your way! 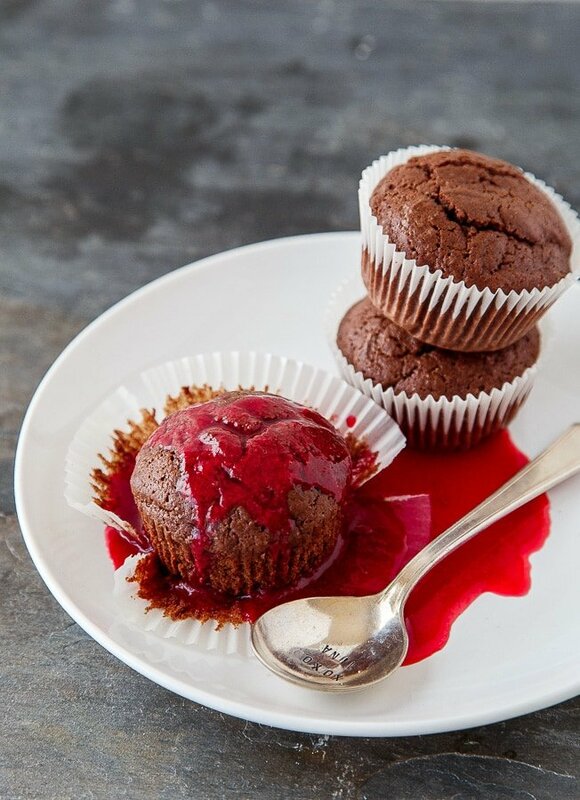 Raspberry + Chocolate, is there really any better combination?! These look glorious! I’ve been reading your blog for years and have made several of your recipes. I was very happy when I read you were publishing a cookbook – I ordered mine from Amazon presale. Congratulations on your QVC appearance & sellout! That’s the first time I’ve ever watched that show! I caught you on QVC last evening…your dessert table was amazing and you were so sweet and endearing. I have to say, I have never watched QVC…ever..so high energy, non-stop talker Dave was some introduction for sure!! I didn’t know when your segment would happen so I watched the whole show…I was overdosed on high power selling by the time you appeared. I plan on buying a book from Amazon…a Christmas Gift Card present for myself. I am looking forward to checking all the yummy recipes out. These look perfect! I was so sad I missed your QVC spot by just a few minutes–I got distracted with my baby and totally spaced it! Speaking of babies, CONGRATS! Such exciting news! It’s truly amazing and I wish you all the best as you enter this crazy-wonderful new time in your life. This looks like winner for sure! That raspberry sauce is amazing!!! I’m a HUGE QVC fan (is that weird) and actually grew up in West Chester, PA. I saw you the other night and was so touched at your authenticity and appreciation when you sold out. These little pound cakes just look SO delicious and perfect for valentines too. I love all that raspberry sauce! Twins! I always forget all the extra yummy add-ons because my patience and fresh-out-of-the-oven baked goods, do NOT go hand in hand. ;) I’m obsessed with these chocolate pounds cake. They are perfect and pretty for the girls, with a little chocolate kick for the boys this valentine’s day. Love! This sounds like the perfect dessert to have around when those dessert cravings hit! I was flipping through the channels the other day and saw your segment on qvc. I loved it and thought the whole idea of dessert for two sounded absolutely lovely. When you sold out and looked like you were about to cry, my husband and I thought it was the most sweet and endearing thing ever! I had to look you up, and after your site started working again, I’m now mega hooked!! Just wanted to say thanks for going on qvc and I can’t wait to start baking! Ooo if you are taking desserts could we have a small batch chocolate mouse recipe? Without raw eggs too, don’t want you taste testing any raw eggs with bubba on board! I’ve never had a CHOCOLATE pound cake. These mini ones look amazing! Chocolate and raspberry is probably one of my favorite flavor combos. You killed it with these pound cakes! There are two more to go, I don’t know how long I can keep them. Maybe in 20mn I’m going to eat again. They are just so good with rasberry sauce. I think all desserts taste best right out of the oven before they even hit a plate ;) Thanks, Lenna! Think this recipe would turn out okay if baked in my little bitty loaf pans ? Wondering about bake time adjustment, any suggestion on that ?